Spatial analysis has always been a hallmark of GIS, the “numerical recipes” which set GIS apart from other forms of computerized visualization and information management. With GIS we can pose questions and derive results using a wide array of analytical tools to help us understand and compare places, determine how places are related, find the best locations and paths, detect and quantify patterns, and even to make spatial predictions. As Chris Cappelli duly notes: “The greatest potential for change and success occurs when we all understand and speak the same language—-the language of spatial analysis.” (see related post on the power of spatial analysis). What better way to speak that language than via a story map? As people continue to explore and share their world using the medium of story maps, some are venturing beyond the simple map tour mode of points linked to photographs, toward “stories” that examine, explore, and showcase the results of a spatial analysis. We’ll likely see more of these analytical stories as the story map medium is introduced into more GIS courses, particularly at the university level. As you explore the story of spatial analysis, please see below a small catalog of analytical story maps. Be sure to visit again as I will try to add to this page throughout the year! New! Unlocking Information from Imagery in ArcGIS, with use cases and analytical workflows showing how ArcGIS provides an end-to-end experience for doing artificial intelligence (AI) with imagery. Esri’s Applied Analysis site includes a Story Map Gallery of Analytic Case Studies. Esri’s Applied Analysis and National Government Sciences Team’s Scientists Communicating with Story Maps Gallery. A story map with both ANALYTICS and suggested societal SOLUTIONS: Take Action: Tools to Understand and Prepare for Extreme Heat. 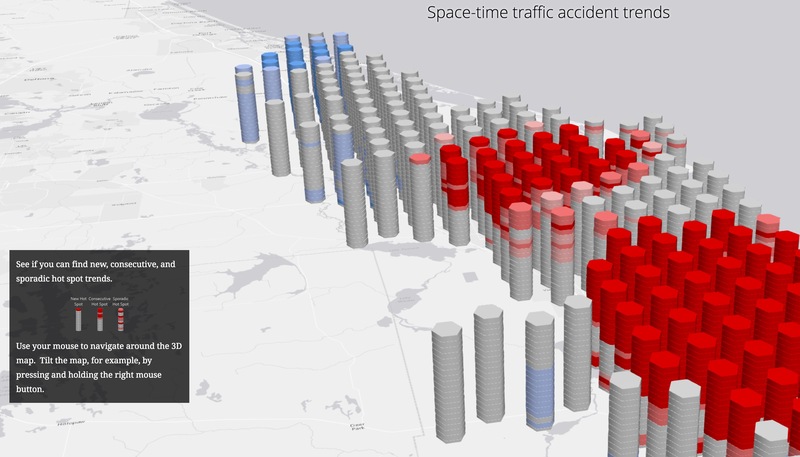 Lauren Scott Griffin’s “Analyzing Traffic Accidents in Space and Time” uses the Story Map Cascade to analyze automobile crash data in Brevard County, Florida using ArcGIS Pro. The study addresses important questions such as where are traffic accidents increasing (including as specific hot spots within a road network), and when are the most dangerous times to be driving. You can also download the data, follow the complete ArcGIS Pro workflows, and access additional resources on ArcGIS Online. Lauren Bennett’s “Drought Impact Assessment” uses the Story Map Series – Side Accordion Layout to guide the viewer through four stages of an analysis, culminating in a map of statistically significant decreases in soil moisture over a 35-year period, as part of longer term monitoring effort. See the demo of the story map at the 2014 Federal GIS conference (minute 2:14). In addition, this video at minute 6:28 is an example of using Python to schedule a task that can grab data from the United States Drought Monitor and recreate it as a live service that might be inserted into a story map. The USDA Forest Service’s Restoration Story Map Atlas uses the same format to show the results of analyses for the Pacific Northwest ranging from identifying the percentage of a watershed that could be effectively treated through active forest thinning, prescribed fire, or use of wildfire, to the results of a bivariate rendering of burn probability by conditional flame length. The Center for Research in Water Resources at the University of Texas at Austin uses the Map Journal app to tell the story of flood risk in and around Huarez City, Peru as based upon hydrodynamic modeling results. See the related blog post about this research. A crowd-sourced story map that asks Higher Education Research Active Collaborations 2018 of Esri Canada. New! A crowd-sourced story map that asks What Questions Have You Answered by Mapping and Spatial Analysis in GIS?, by Esri Canada. Water Wells Site Selection in East Africa using GIS, by Claudia Cáceres & Sarah Osailan of Claremont Graduate University. Deep Learning for Detection, Identification, and Mapping of Cassava Diseases, a Microsoft AI4E Azure Grant project by Kimani Mbugua, PhD student at Claremont Graduate University. Enabling Apps for Green Infrastructure Planning by Esri’s Ryan Perkl, describes the main components of green infrastructure networks and the planning process, gives an overview of Esri’s Green Infrastructure Initiative, and reviews the data, analytical models, and apps needed to be successful in determining what to preserve and where, and which areas need restoration or reconnection. A related story map provides Solutions for 3D Basemap and Development Review for urban and regional planning. See also the 3D Scene Layer Group in ArcGIS Online. The Great Lakes Coastal Wetland Restoration Assessment of the USGS and the New College of Florida (Justin Saarinen). The Emerging Hot Spots of Forest Loss of the World Resources Institute’s Global Forest Watch is based in part on their journal article in Environmental Research Letters. University of Oxford’s Global Poverty Map Journal explaining the Multidimensional Poverty Index. Reefs at Risk, showing the results of GIS vulnerability analyses at varying scales (related article). As part of MarineCadastre.gov, NOAA and BOEM have produced Exploring Ocean Wind Energy (which includes a link to download the data used in the analysis), Evaluating Shipwreck Density by Lease Block, and Exploring Vessel Traffic in Jacksonville, Florida. Wildfires in Oregon is a nice mix of science and policy. Warming Cities of Europe, which employs climate models (see related blog post). Sea Level Rise Inundation for the State of Delaware (see related blog post), and a story map employing a similar analysis for Dorchester County, Maryland. Great Lakes Coastal Land Use, showing the results of FEMA HAZUS models in GIS. Feeding the World: Can Global Crop Production Meet Future Demands? Ocean Acidification, with calculations of future scenarios of ocean aragonite saturation, “swiping” between 1885 and 2095. “We Baby Turin” or “Wellbeing for the Baby Turin,” drawing inspiration from the Save the Children’s Atlas of Children at Risk, includes spatial analyses of proximities to children’s services in Turin (Torino), Italy (available in both Italian and English). A series of spatial analytical results for “connecting clients, services, and locations” by the Data Analysis for the Gilchrist Center. Point and route density analyses of retail sales data are featured in Ontario Mills – Brand Alliances. Modern version of Florence Nightingale’s coxcombs (mapping of multivariate data), showing the mortality of British Soldiers in the Crimean War. See related blog post. Results of spatiotemporal analyses of invasions of non-native aquatic mussels in the US and variations in wildlife strikes on civilian aircraft in the US. Updated! Results of Storm Surge Inundation (SLOSH Maximum of Maximums) Modeling. The second to the last panel of this Harbor Seal Survey Map and Methods story map uses a Shiny app to allow the user to interactively model Oregon harbor seal population dynamics with a simple numerical model. The informative Motion of Tectonic Plates story map includes relative and absolute plate motion vectors, seismic strain graphs, and measurements of coseismic horizontal crustal displacement. Esri’s Witold Fraczek and Lenny Kneller explain and analyze the poles of inaccessibility and their locations in Antarctica, Eurasia, North America, South America, Africa, Australia, and the Arctic Ocean. See also the related blog post. Updated! Predicting Cetacean Density with Geospatial Models explains the process behind collecting marine mammal survey data and the methodology used to create habitat density distribution models. How has the Columbia Glacier (in Alaska) Changed?, which includes an interactive application that calculates the volume of water that has melted from that glacier between 2009 and 2013. This Internet of Things (IoT) story map highlights various analytical uses cases for different industries or user communities. It will continue to be updated with additional demos and use cases. Bittersweet Chocolate: The Climate Change Impacts on Cocoa Production in Ghana includes some spatial modeling results, while also pointing the viewer to a few peer-reviewed scientific studies for further in-depth information. How Certain are Land Use Change Projections? is an overview of the PhD thesis of Judith Verstegen of the University of Utrecht, Netherlands. Evaluating the Mysteries of Seismicity in Oklahoma includes an analysis of the cumulative spatial influence of factors related to seismicity in the state, as well as several earthquake magnitude hotspot analyses. Town of Chebeague Island Sea Level Rise Vulnerability Assessment is a story map version of a report of the same name by the Greater Portland (Maine) Council of Governments. Analyze vector-borne disease with the ArcGIS Predictive Analysis Tools includes the analytic use case of predicting Aedes habitat and suitable locations for vector borne disease, along with a peer-reviewed journal article by Esri solution engineer, Dr. David Attaway et al. on risk analysis for dengue suitability in Africa. Connecticut’s Changing Landscape uses live image services in a rigorous study of land cover change within that state rom 1985-2010. EPA’s Climate Resilience Evaluation and Awareness Tool (CREAT) Climate Scenarios Projection Map provides easy-to-access scenario-based climate change projections for a variety of different scenarios across the US. The Bureau of Reclamation’s Climate Change and Water details and visualizes projected changes in temperature, precipitation, and snowpack across the eight major Reclamation river basins illustrated in it’s SECURE Water Act Report to Congress. It also allows for direct downloads of the data directly from the story map. The Chesapeake Bay Program and Region 3 of the EPA present Cleaner Air, Cleaner Bay to describe benefits from Clean Air Act regulations that decrease NOx emissions through implementation of the Chesapeake Bay Total Maximum Daily Load (TMDL). Sea Level Rise and Storm Surge Effects on Energy Assets assesses the potential sea level rise and storm surge risks to energy assets in the Metropolitan Statistical Area (MSA) of specific cities in the United States. Evolution of the 2010-2015 Texas Drought highlights research of the NOAA Climate Program Office’s Modeling, Analysis, Predictions, and Projections program to better monitor, understand, and predict drought. See also Esri’s Drought Tracker. 2013 Colorado Flood Recovery: Three Years of Progress illustrates various analytics and resulting advances made in recovery efforts since that major event. The Rise of the Andes in Ignimbrite Super Eruptions explores the Neogene geologic history of the Andes mountains, links geochemical and spatial patterns of ignimbrite super-eruptions to uplift and the crustal evolution, and highlights the potential of GIS to analyze and share scientific data (references). Useful workflows for drone point cloud classification to help you unlock the insights in your drone imagery. When Rising Seas Hit Home is a national analysis by the Union of Concerned Scientists that identifies WHEN hundreds of US coastal communities will face chronic inundation and possible retreat as sea levels rise. Users can explore these communities and discover not only the consequences of rising seas, but viable solutions. The StormSense Project highlights some of the methodology behind forecasting flooding from storm surge, rains, and tides. First place: Sara Lubkin, N. Virginia Community College, USA, What Can Beetles Tell Us About Past Climates? Updated! Oregon State University’s HJ Andrews Experimental Forest Dashboard shows real-time data from 125 different environmental sensors, as well as real-time web-cams. Related blog post. Field studies of the 2013 Current Creek Fire in Lake Clark National Park, Alaska. Understanding the impacts of the 1964 Great Alaska Earthquake by the USGS. Scientific projects and field sites of the NOAA Biogeography Program. Field studies of the Geology of the Black Hills by the South Dakota School of Mines and Technology. Study areas of spatial analysis exercises featured in the Esri Press book, The GIS Guide to Public Domain Data by Joseph Kerski and Jill Clark. Alaska Revealed: High Resolution Elevation Data. A nice complement to the Columbia Glacier story map mentioned above. Dawn Wright joined Esri as Chief Scientist in October 2011 and is responsible for strengthening the scientific foundation for Esri software and services, while representing Esri to the national and international scientific community. She is also professor of geography and oceanography at Oregon State University and has participated in several initiatives around the world over the past 20 years to map, analyze, and preserve ocean terrains and ecosystems. Follow her on Twitter @deepseadawn. This entry was posted in Storytelling with Maps and tagged analysis & geoprocessing, ArcGIS Online, Dawn Wright, science, spatial analysis, story map templates, Story Maps. Bookmark the permalink. Reading this post about analytical story maps brought to mind a possibly interesting and powerful cross-fertilization of technologies: Esri ‘Story Maps’ with RStudio ‘Shiny’ apps (http://shiny.rstudio.com/gallery/). I’ve made a couple of story maps and I’m currently learning how to code Shiny apps and it seems like it should be possible to embed a Shiny app into a story map in order to allow for interactive user input. It seems that the Place to Play Story Map is no longer publicly accessible – could this be fixed? Thank you Matt. The links have now been fixed. The story map was transitioned to a new project within the LearnGIS site, so the new link takes you to the top level of that project to see the additional resources. Best wishes!